Making an overnight slow cooker breakfast casserole is the answer to all of your ‘what’s for breakfast’ worries. 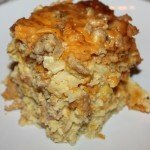 A slice of the overnight slow cooker breakfast casserole – pure goodness! With a few basic ingredients layered in a slow cooker, you will soon wake up to a delicious breakfast that is ready to eat. Not to mention, the amazing smell will be sure to get your senses going and the delightful taste will be sure to please even the most picky of eaters. 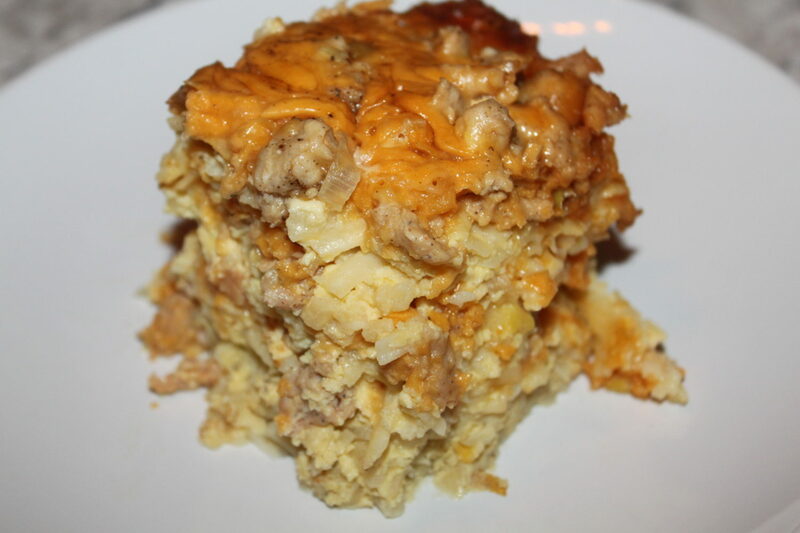 We always make at least one breakfast casserole the morning of a big holiday. There is so much to do, family to entertain, and no time to worry about what’s on the menu. Just throw it in the slow cooker the night before and it will be ready to eat as everyone arises! We love to use our 6 quart Programmable Crockpot for this recipe. It allows the casserole to be cooked for a set amount of time and will then turn to warm mode so it is ready when you are! You can purchase the same slow cooker that we use at Amazon.com. And just in case there are any leftovers (which isn’t likely), you can freeze the remainder and use it in breakfast burritos for another morning. 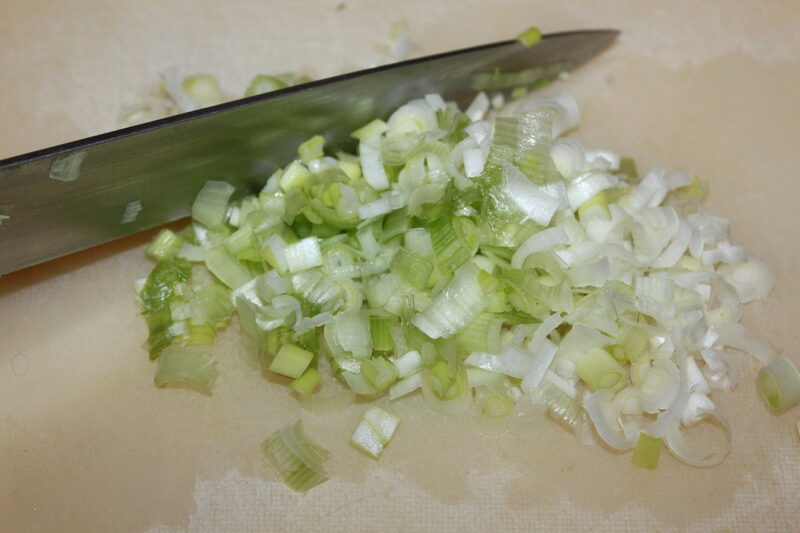 Dice the green onions to add another depth of flavor to your dish. After layering the ingredients, pour the egg mixture over top and let the slow cooker work it’s magic. 1. Grease the insert of a 6-quart slow cooker with extra virgin olive oil or cooking spray. 2. Layer ⅓ of the hashbrowns on the bottom, season to taste. 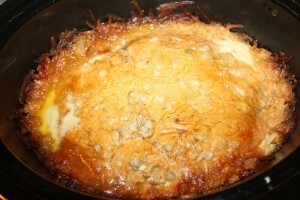 Top with ⅓ each of the cooked breakfast meat, green onions and cheddar cheese. Repeat the layers two more times, with the top layer being cheese. 3. In a large bowl, whisk together the eggs, milk, garlic powder, salt and pepper. 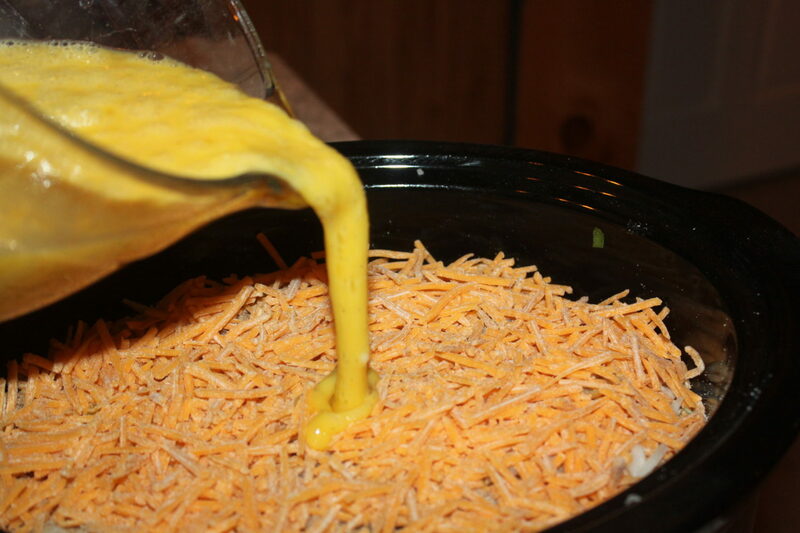 Pour the egg mixture over the top of the layers in the slow cooker. 4. Cook on low for 6 to 8 hours (edges will be browned). Each slow cooker cooks at different temperatures, therefore the results will vary. Ours was perfectly cooked at the 7 hour mark. Our breakfast casserole was ready to eat at the 7 hour mark. Absolutely delicious! You can also check out our original book, Growing Simple, available on Amazon.com. This post may contain affiliate links. Grease the insert of a 6-quart slow cooker with extra virgin olive oil or cooking spray. Layer ⅓ of the hashbrowns on the bottom, season to taste. Top with ⅓ each of the cooked breakfast meat, green onions and cheddar cheese. Repeat the layers two more times, with the top layer being cheese. In a large bowl, whisk together the eggs, milk, garlic powder, salt and pepper. Pour the egg mixture over the top of the layers in the slow cooker. Cook on low for 6 to 8 hours (edges will be browned). Each slow cooker cooks at different temperatures, therefore the results will vary. Ours was perfectly cooked at the 7 hour mark. Can be stored in the refrigerator for up to 4 days. ← Merry Christmas World! And A Special Thank You From Old World Garden!